It was such a gift to see and hear some of the most brilliant minds on the planet all under one roof. There are no words for the magic that happens energetically when so many high-conscious beings come together with the intention for good. The spectacular Gate 2 was attended by more than 2,000 people at the Saban Theatre in Beverly Hills, with standing room only. The theme of "Only a New Seed Will Yield a New Crop" celebrated transformational entertainment and media, with presenters and performers entertaining, inspiring and informing. Featured were Eckhart Tolle, Jean Houston, Jim Carrey, Don Miguel Ruiz, Marianne Williamson, Edward James Olmos, Fred Alan Wolf, Barbara Marx Hubbard and many others. Louie Anderson emceed, and he had the audience laughing every time he came on stage for the entire 7-hour presentation. It was such a gift to see and hear some of the most brilliant minds on the planet all under one roof. There are no words for the magic that happens energetically when so many high conscious beings come together with the intention for good. 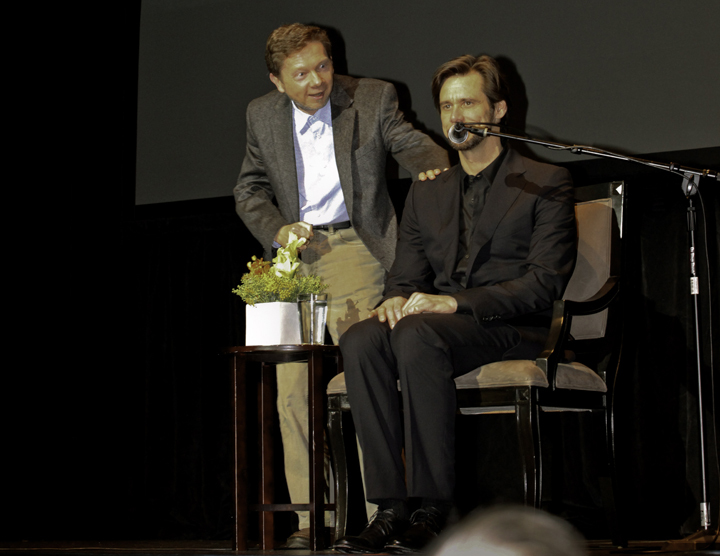 When Eckhart Tolle was announced Jim Carrey walked out as if he were Eckhart, imitating him perfectly. There was good-hearted humor between them and much respect to all who came on the stage throughout the evening. 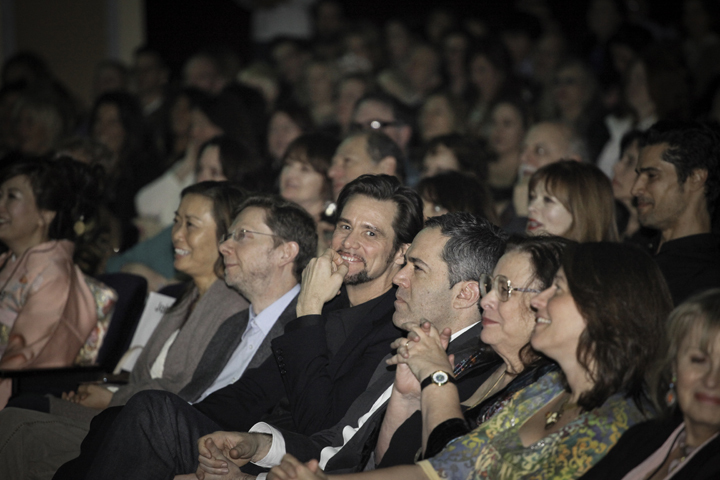 "Vine Divine," Jane Carrey (Jim Carrey's daughter), and George Krikes beautifully sang a duo to the enchanted audience. The various musical acts and performers were all clearly committed to actively influencing humanity in a positive way. John Raatz is the founder, and Eckhart Tolle and Jim Carrey are honorary co-founders of The Global Alliance for Transformational Entertainment (GATE). The alliance is shepherding the emerging and rapidly-expanding transformational entertainment and media genre worldwide. Transform the world by transforming entertainment and the media. To read more about John Raatz and Gate please see my previous article. Many well-known spiritual speakers, as well as experts in quantum physics, talked about the shift and the awakening that is going on the planet now and indicated what an exciting time it is to be alive. They suggested we are becoming a new type of human as we connect with our higher selves. This is a time of great opportunity for healing and transformation, personally and universally. Marta M. Mobley, producer and Gate 2 event producer/speaker, told me, "I think that transformative media provides education and inspiration to become healthier, more loving and self-realized human beings." Paul H. Ray writes about his study of cultural creatives in a book called The Cultural Creatives: How 50 Million People Are Changing the World by Paul H. Ray., Ph.D., and Sherry Ruth Anderson, Ph.D.
"Hollywood is divided among the creative people and the suits. The creative people love the cultural creatives' ideas. But the suits have to be convinced it's for real, so what I want to tell the suits tonight is there's 70 million cultural creatives in the United States alone. That's $120 billion in entertainment and book grosses every year. If that does not make it real to the suits then nothing can." "A big thank you to the Gate a thousands times over for their commitment to this, and to the audience I say please support Gate." "I am thrilled to be here and have a little fun and move things along and do my part to add a little lightness to the proceedings. I like this organization. I think I have always tried to connect my comedy to my art. Everyone always comes to one point in their life as an artist where you can either let your heart guide you or your ego." 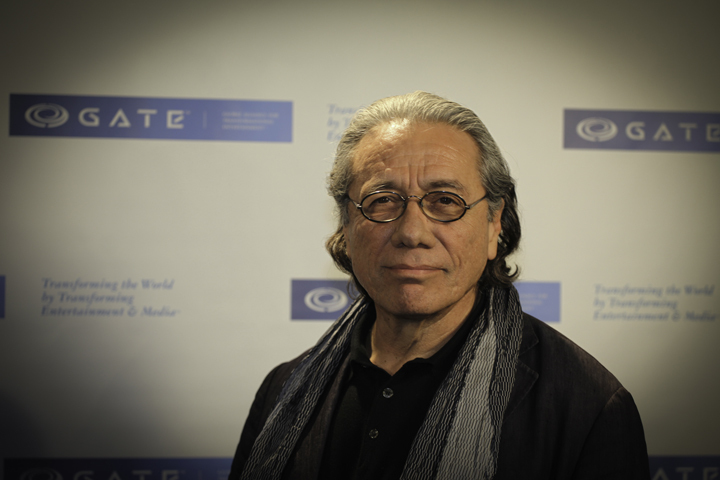 "I spoke about the power of story and the future of the planet at the story conference today. Because I think the power of story is absolutely essential to building a socially-just and ecologically-sustainable future. We need to collectively build a movement that connects ecology, social justice and cosmology using the power of dream, the power of story, the power of art and the power of action, so the power of story is precisely one of the major powers that we need to tap into." "I gave a talk today on quantum artistry during the story conference, which takes ancient spiritual traditions and quantum physics and merging them in the story of human origin, which is really where art originates. Because art comes from us, and in order to understand the true essence of art we really have to know ourselves. We have to understand our origin and our creative source. I am really happy to see this type of awareness has reached an organized level in Hollywood, because obviously the media has a huge influence on people. My own contribution is a book that I have written called "Pope Annalisa," which was a winner of seven national awards. "Comedy is one of the fastest ways to get into the moment. You are never laughing at something and worrying about your taxes at the same time. People live with a very big guard up, and once they are freed through laughter, they can approach life with a freedom and fearlessness they didn't see before. We can easily live in that state if we want, we just have to find the humor in things. Trust me, it is in EVERYTHING." "I am very proud to be here at the Gate, where I believe we are going to transform the global community through film and the arts. I was very grateful to be in the films "Spiritual Warriors" and "Wayshower." I was grateful back in 1969 to teach Merv Griffin yoga on his show and in the 90s I got to teach Oprah, too! She allowed me to chant to the audience. I also have a show called "The Sally Kirkland Show" on healthylife.net for motivation, practical spirituality, alternative health and inspirational guests who help you widen your world to the positive aspects of life and spirit." "Each of us views the world, and who we are in it, based in large part on the messages we receive from the media. These, in turn, inform many of our actions (and inactions) in the world. New messages, new perceptions of ourselves, of the world, and of life, will inspire us to the new behaviors now needed to head humanity in a direction that honors life, love, and peace, leading to a sustainable existence on planet Earth. Join with us and with others from around the world to help establish GATE and further our vision of 'Transforming the World by Transforming Entertainment and Media.'"